Thermpack programme relates to the “Development of innovative materials with improved thermal insulating properties for packaging applications” project and is co-financed by the European Union. Τhe programme’s objective is to contribute to the development of new packaging materials with improved thermal insulating properties, to be used as packaging solutions within the hot & cold, food and beverages industry. The global Thermal insulating packaging materials market is a growing market expected to reach 14,2 bn US dollars by 2020, with an annual 5,12% rate. 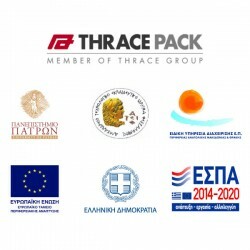 By taking part through its subsidiary Thrace Pack, Thrace Group aims to contribute to the production of products with improved properties and to increase its market share in the food & beverages packaging sector. The project is financed by the Regional Operational Programme in Eastern Macedonia and Thrace 2014-2020 - Action Enhancement of Investment in Research, Development and Innovation of the chemical - polymeric materials industry. Thrace Group participates at the programme with the University of Patras and the Alexander Technological Educational Institute of Thessaloniki.